I was in a Country Road store recently and the following rack of clothes caught my attention. Rather than call these clothes a “sales” rack or discount them heavily they referred to them in a positive light. 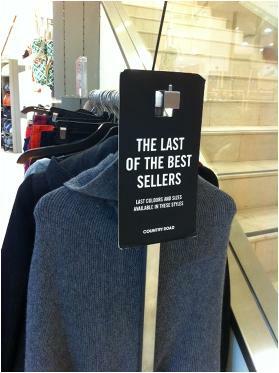 These are the “last of the best sellers”. To me that made this rack go from bargain basement, to a far more enticing proposition instantly. What words are you using in your business that might have a negative connotation? “Sorry” “Unfortunately” “Sale” “Bargain” “Discounted” “Economic Downturn”. Could a simple perspective shift like the “last of the best sellers” rephrase any of them in a positive light? Those of you who work in a retail environment will know how frustrating it can be keeping your shopfront clean and neat during autumn with the wind sweeping leaves in and out open doors. This fabulous florist I recently passed had taken leaves in the shop to a whole different place. Their front window was decorated with leaves, their floor was covered in Autumn leaves and it was nothing short of SPECTACULAR. A negative, turned into a gorgeous show case. Inspiring stuff. What negative can you make into something stunning today?